The Smithsonian’s Bureau of Ethnology (renamed the Bureau of American Ethnology in 1897) was established in 1879. Its first director, John Wesley Powell (1834-1902), helped shape the field of ethnology and anthropology. Powell’s exploration work and the findings referenced in his Report of the Exploration of the Colorado River of the West and Its Tributaries. Explored in 1869, 1870, 1871, and 1872, under the direction of the Secretary of the Smithsonian Institution assisted his efforts as director. The Bureau became the official repository for material and collections relating to American Indians, including those artifacts collected on federal surveying and collecting expeditions to the American West. Powell believed that the dissemination of knowledge about American Indians was being compromised by the encroachment of whites into traditional native lands. He felt that the study of such “savagery,” as he called it, would help preserve the tribes and knowledge about them. 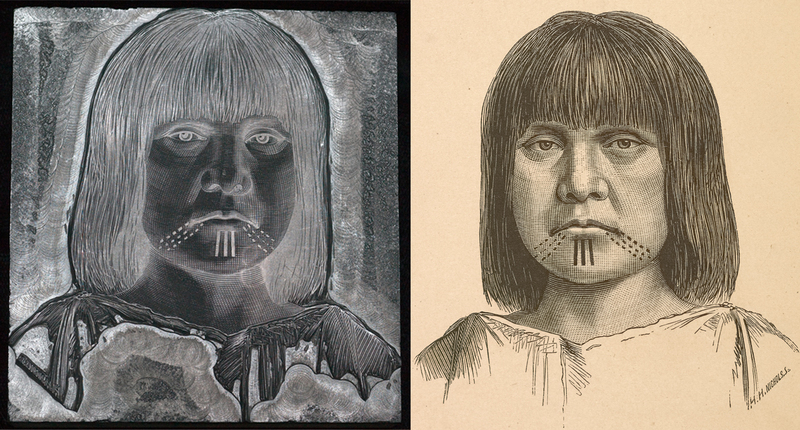 The Bureau’s employees prepared scores of articles for its Annual Reports, Bulletins, and the series Contributions to North American Ethnology.Early publications were illustrated using relief printing with woodblocks engraved after field sketches. The engraved woodblock images were carved from end grain blocks of wood, with their non-printing areas cut away. 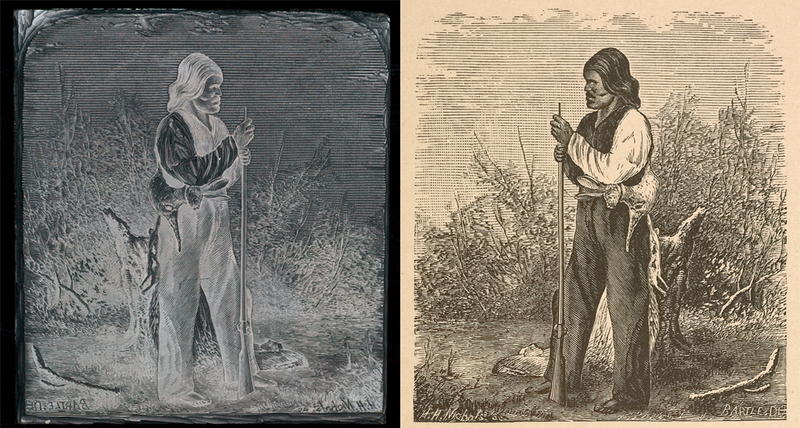 Later imagery was prepared using relief printing electrotypes after field photography. 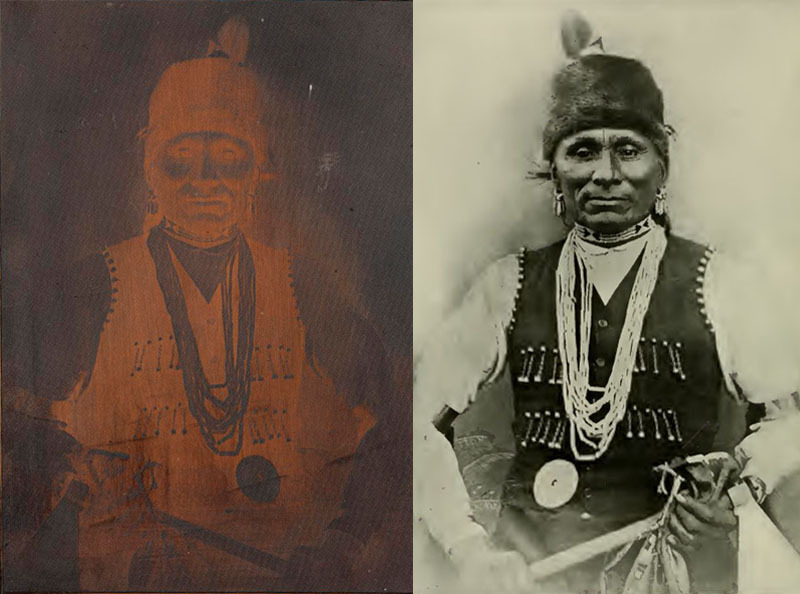 The electrotypes, prepared by an electroplating process used commonly in the late 19th century and afterwards, offered a method of duplicating the tonal variations of photographs. Both engraved woodblocks and electrotypes were prepared or mounted to about one inch high in order to print along with moveable type arranged to produce the text of publications. 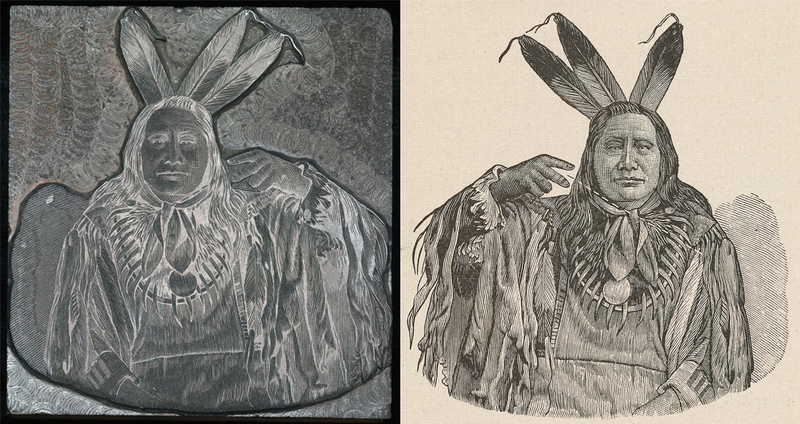 Wood Engraving (left) and Published Print (right) of “Huch’-nom tattooing” Click image for more examples. The engravings and electrotypes represent the work of both an original artist and a graphic artist. Engraved works, particularly finer engravings, often include the initials or monograms of both the original artist and the graphic artists in the bottom corners of the printing surface. This practice did not carry through to electrotype printing. Sketches and photographs prepared in the field for the Bureau were often created by the publication’s author, and therefore not always identified or listed. In Powell’s Report of the Exploration of the Colorado River… however, some illustrations include the monogram of the original artist Thomas Moran (1837-1926). Moran an eminent painter and printmaker of the time traveled with the expedition. Other publications are marked with the initials or monograms of graphic artists such as wood engraver Henry Hobart Nichols Sr. (1838-1887). Nichols is presumed to be responsible for the majority of the Bureau’s early engravings, if only as a supervisor to other engravers. He also engraved the signature image that appeared on report title pages. Nichols was also closely associated with the Government Printing Office, founded in 1861, that printed the Bureau’s publications. John K. Hillers (1843-1925), a photographer employed by the Bureau to prepare portraits and landscapes, also directed the Bureau’s photographic efforts. He and other photographers accompanied BAE expeditions, but Hillers was given full credit for photographs produced during his tenure. The Bureau’s annual budgets list specific payment amounts for illustrations, photography, and their materials, supporting the understanding that visual documentation was an important component of the Bureau’s mission. The Bureau’s publication illustrations feature a wide variety of subjects, such as pottery of the Zuni tribe of New Mexico, blankets of the Navajo tribe of northeastern Arizona, and hunting equipment and practices of the Eskimo tribes of Alaska and Canada. Other images illustrate tribal communities, and the topography and landscape of the continent. The BAE was dissolved in 1965, when it was absorbed into the Office of Anthropology at the U.S. National Museum, now the Department of Anthropology in the National Museum of Natural History. The examples of the engraved wood blocks and electrotypes used to print the Bureau’s publications were retained initially, it is presumed, for reprinting possibilities. Today we value the engraved wood blocks and electrotypes as unique representations of some two thousand printed illustrations prepared between the 1870s and about 1920. The illustrated blocks serve to assist our understanding of printing history, the artists, the quality, quantity, and subject matter of illustrations prepared during this period. The blocks are now retained in the Graphic Arts Collection, a unit of the National Museum of American History that is responsible for the Smithsonian’s printing history collections. .
Engraved woodblock of a "Dancer holding up the great plumed arrow"
This engraved woodblock for “Dancer holding up the great plumed arrow” was prepared by the Government Printing Office in Washington, D.C.; the print was published as Figure 54 (p.434) in an article by Dr. Washington Matthews (1843-1905) entitled “The Mountain Chant: a Navajo ceremony” in the Fifth Annual Report of the Bureau of Ethnology to the Secretary of the Smithsonian, 1883-84. Engraved woodblock of the "Arikara sign for lie or falsehood"
This engraved woodblock of an “Arikara sign for a lie or falsehood” was prepared by the Government Printing Office in Washington, D.C.; the print was published in 1881 as Figure 233 (p. 393) in an article by Garrick Mallery (1831-1894) entitled “Sign Language Among the North American Indians” in the First Annual Report of the Bureau of Ethnology to the Secretary of the Smithsonian, 1879-80. Engraved woodblock of "Captain John, a Ni'-shi-nam chief"
This engraved woodblock of “Captain John, a Ni’-shi-nam chief” was prepared by engraver Henry Hobart Nichols (1838-1887) and the Government Printing Office in Washington, D.C.; the print was published in 1877 as Figure 27 (p.314) in an article by Stephen Powers (1840-1904) entitled “Tribes of California” in Contributions to North American Ethnology v.3. Contributions was published by the U.S. Geographical and Geological Survey, a precursor to the Bureau of American Ethnology under the direction of John Wesley Powell (1834-1902). 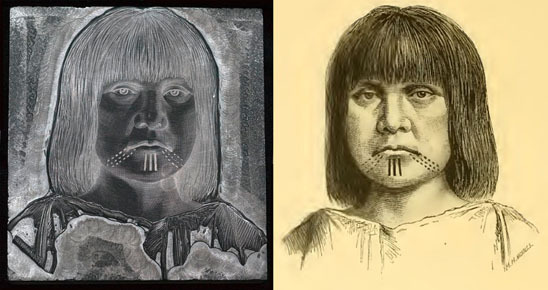 D. H. Bartle created the original image. This engraved woodblock of a man walking beneath a bare tree was prepared in about 1880 by the Government Printing Office in Washington, D.C. for the Bureau of American Ethnology. Engraved woodblock of "Huch'-nom tattooing"
This engraved woodblock of “Huch’-nom tattooing” was engraved by Henry Hobart Nichols (1838-1887) and prepared by the Government Printing Office in Washington, D.C.; the print was published in 1877 as Figure 14 (p.142) in an article by Stephen Powers (1840-1904) entitled “Tribes of California” in Contributions to North American Ethnology v.3. Contributions was published by the U.S. Geographical and Geological Survey, a precursor to the Bureau of American Ethnology under the direction of John Wesley Powell (1834-1902).